Dr. C. Michael Willock is a Chapel Hill dentist—and a relentless student—with profoundly holistic interests and abilities. “We’re talking about chronic illness in this issue, and I am reminded, in powerful ways, of the relationships between dental health and full-body health,” he says. “Tooth decay is one of the most common chronic infectious diseases of childhood, for example—more common than asthma. Nearly 40 percent of youngsters entering kindergarten in our state have already been affected by tooth decay. They are on a slippery slope. One chronic health condition often leads to another. “I still see patients in this practice who are long-time smokers, still puffing away, and in a kind but relentless way I encourage them to put down the habit. Beyond the obvious breathing and general health issues, from the oral standpoint we see gum tissue that often has immune response inflammation because nicotine is a drug that is a vasoconstrictor. There is a little muscle fiber around every capillary in our body, and there are drugs that can either relax this fiber, or drugs such as nicotine that can constrict it. Dr. Willock spends weeks of each year in classrooms and conferences, steadily adding to his understanding of the relationship of oral health to full body health. In the process, he has become knowledgeable in many areas, including dietary issues and understanding effective use of supplements. He is also an accredited member of the International Academy of Oral Medicine and Toxicology (IAOMT), and completed an 83-hour post-graduate course in environmental medicine for the health care professional at the Southwest College of Naturopathic Medicine, in Scottsdale, Arizona, in classes made up of physicians and naturopaths. He was the only dentist in the class. “Dr. Tennant was among the first researchers to make links between the health of the teeth and the health of other organs in the body,” notes Dr. Willock. “Now all of medicine is beginning to recognize the effects of dental materials and infections on the rest of the body.” Dr. Willock regularly continues his studies with Dr. Tennant and Dr. Hal Huggins, another pioneer. He is intensely interested in deepening his expertise in the broad field of biocompatibility, he says. 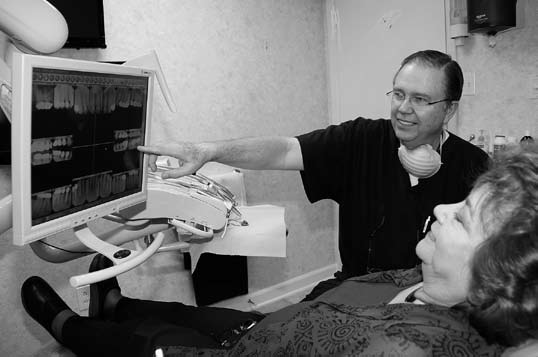 “Every material and substance I put into a patient’s mouth has the potential to harm or help that patient. It’s well-established, for example, that the mercury used in amalgam fillings can pose serious health problems for people who are sensitive to that substance.